Extended Layout is a classic forum layout with an unique feature to show one level deeper information in advance. You can see latest topics of each forum on Forum List and latest posts of each topic on Topic List. The screenshot above displays Extended forum layout with two modes. On first (left) mode, besides Forum title and Description you can see a list of latest topic title/author/date information under each forum panel. On second mode (right) the latest topics are collapsed. This can be managed in settings page or can be opened/collapsed using the blue, small arrow next to orange “Recent Topics” phrase. 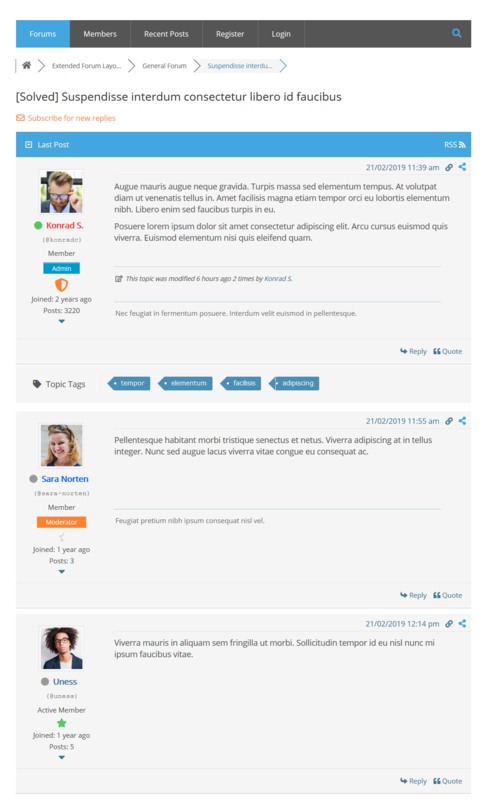 Extended layout makes your forum busy, lively, active and increases forum engagement. Most wpForo users use this Layout. Users can easily see what’s new in all forums without navigating to each forum page. This saves users’ time and help them follow to all forums on forum home page. There are two specific options in Forums > Settings > Forums admin page. You can set Recent Topics opened/collapsed by default and set number of recent topics displayed under each forum panel. The screenshot above displays Extended topic layout with two modes. On first (left) mode you can see First Posts of each topic and a list of Latest Replies under each topic panel. On second mode (right) they are collapsed. This can be managed in settings page or can be opened/collapsed using the blue, small arrow next to orange “First post and replies” phrase. There is one specific option in Forums > Settings > Topics & Posts admin page. You can set Recent Posts opened/collapsed by default and set number of recent replies displayed under each topic panel.